Simple and clean, the title song really presents this game well. A time when games weren’t plagued with DLC and constant updates, a simpler time when developers had one chance to get a game right (or completely screw it up). One of the greatest games on the PS2 is given new life in fancy high resolution. Before I continue this, I want to state that this will be a 2 part review, this first part focuses on the Kingdom Hearts Final Mix HD part of the package, so don’t assume that the score given is indicative of the entire Kingdom Hearts 1.5 ReMix package. Highly anticipated, I was looking forward to playing this again and made it a point not to replay the PS2 version of Kingdom Hearts since this was on the horizon. A little history for those who aren’t as in the know, this game was the first game in the entire KH history, it was like the make or break for this action RPG crossover. To be fair, I was NOT keen on the idea when I first heard of it, I love Disney but the idea of crossing over Disney characters with some Final Fantasy characters in a whole new world seemed so out there to me, and I was so very wrong to assume it wouldn’t work. I remember how I felt when I first saw the opening of Kingdom Hearts on the PS2… “Simple and Clean” by Utada Hikaru set the stage for what would be a very memorable gaming experience. The story centered on the link between worlds, prior to the doorways becoming unlocked and the Heartless invading these worlds, there wasn’t really anything connecting them. 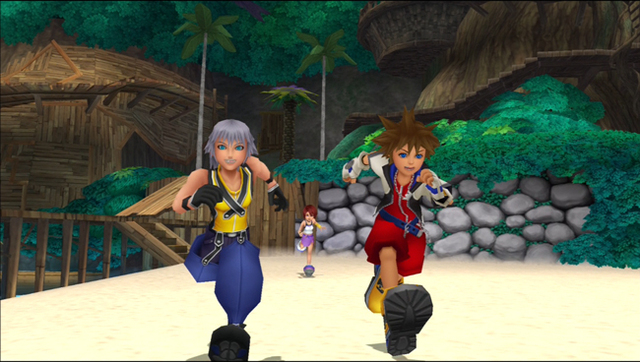 Sora is a young boy living on an island with his two closest friends, Riku and Kairi. The Heartless invade their island and somehow their world is lost, the trio are separated and thus starts Sora’s journey to find them. Before their island vanishes, Sora is given the power of the Keyblade, a weapon meant to destroy the heartless and lock down the pathways between worlds. There isn’t much story about the Keyblade yet (that is saved for later installments) but somehow this young boy instinctively knows how to wield it… it's the whole fate thing; he did live on Destiny Island. Anyway, after the Heartless caused their world to vanish, the trio is separated and Sora is determined to find his friends. On the Disney side of the coin, King Mickey has vanished and had left his head knight and mage, Goofy and Donald Duck, in charge of finding the one who wields the key. Eventually, the Keyblade master runs into Donald and Goofy and their journey begins. The story is fairly linear with some exploration, the worlds that Sora travels to are modeled after various Disney movies. The Final Fantasy element acts more like a cameo, rather than having a world dedicated to one of the games, characters from various FF games make cameos throughout the many worlds he’ll travel to. He first encounters Tidus and Wakka (from Final Fantasy X) and Selphie (from Final Fantasy VIII) as kids Sora’s age on Destiny Island, after leaving his own world Sora meets Leon (a versions of Squall Leonhart from Final Fantasy VIII) and Yuffie (from Final Fantasy VII), eventually meeting an alive and well (spoilers) Aerith (also from Final Fantasy VII). I personally like how they integrated the FF characters into the KH world. The various Disney worlds stayed (more or less) true to the source material, which if you’ve watched the movie the world is based on, the experience would feel very familiar. The story isn’t very confusing as long as you pay attention to the narrative throughout, you’ll pretty much get the gist of the whole journey. Come the final battle and ending scene, you’ll once again be treated to Utada Hikaru’s “Simple and Clean” and watch as one of the best endings in a Square Enix game plays out. The strongest part of this entire package is the story, which still holds up surprisingly well for a game that came out over a decade ago. What a beautiful package this classic game is wrapped in, the HD transfer looks fantastic and if you’ve played the original on PS2, this should be immediately evident. The game looks like it could have been a current gen game, the graphics from the original held an animated/cartoon like sensibility, much like that of a Disney movie, so up-resing the textures a bit and increasing the graphical fidelity creates a gorgeous look to the game that feels so fresh but at the same time very familiar. I can’t think of many 11 year old video games that can still look that good with an HD upscale, even games like God of War looked kind of cheap in HD, the art direction they chose to go with ensures a very timeless look, Kingdom Hearts is the two-button-notch-lapel-tuxedo of video games. A stellar voice cast of various Disney mainstays, most of the voice actors portrayed their respective characters in either the movie or subsequent direct to video releases/TV series. Big names like Robin Williams and Danny DeVito didn't reprise their roles of Genie or Phil (instead voiced by Dan Castellaneta and Bobby Costanzo respectively) but other’s such as Sean Astin (Hercules), Gilbert Gottfried (Iago), and James Woods (Hades) returned to voice their respective characters from the Disney properties. As far as the rest of the voice cast goes, Haley Joel Osment (Sora), David Gallagher (Riku), and Hayden Panettiere (Kairi) play out their respective roles wonderfully. While the game was one of the best-voiced games I’ve ever played, it was a bit sad to me in some respects. Some of my favorite performances would be from voice actors who would not reprise their role in the sequel. Billy Zane as Ansem, David Boreanaz as Leon/Squall Leonhart and Mandy Moore (this one was my ABSOLUTE favorite!) as Aerith, while sad that I know they won’t reprise the role in the sequel, it was nice to hear them portray the characters again. The music is instantly recognizable, Kingdom Hearts boasts such a great soundtrack, and it never bothers when playing. The only level that grated on me (and it did back then as well) was the Little Mermaid level and the looping instrumental version of “Under the Sea” constantly playing in the background. The sound effects are whimsical and the different versions of the “clang” for every variation of Sora’s Keyblade make the switch between weapons worth far more than just stronger attacks or greater magic. The level design does leave a bit to be desired, most of these issues will be reflected in the following gameplay section, but as far as level design is concerned. Far too many levels relied very heavily on platforming. They weren’t long or hard to navigate mind you, but a lot of backtracking and moments where landing a combo would send me dropping below an area I didn’t mean to go, it can get frustrating and this was something that was addressed come sequel time, but in playing the original… levels that I feel should not have taken me so long to complete end up needlessly taking too long. Aesthetically though, they were gorgeous, the sandy streets of Agrabah or the box like appearance of Wonderland were heavily inspired by the source material. If you are a fan of Disney movies, the level design will be very much a treat to the eyes. Battles aren’t bad; Final Mix introduced several new abilities not present in the original game that made battles feel more quick paced and visceral. The camera was fixed, while some parts of the game don't allow you to manipulate the camera, in battle it doesn’t move quite as wonky as it did in the PS2 version of the game. Rather than using the L1 and R1 button to control camera angles, you can adjust your camera with the right analog stick (much like in Kingdom Hearts 2) so while not the same experience gameplay wise as the sequel, little touches like that help out greatly… especially since it’s pretty much standard to use the right analog stick to control camera angles. The battle system clearly shows its age, while the added abilities of Final Mix do help with the speed of battles, battles feel dated and while better than before, the camera angle can still get wonky in the heat of battle. This can make for frustrating moments especially when a fireball hitting you from behind drops your HP down to zero. As much as I loved this game I hated the platforming, it felt tacked on then and definitely shows its age come HD rerelease. While improved control of the camera is very much a welcome change, it doesn’t do much to improve the platforming elements. Your AI companions aren’t the best, you can set basic behavioral actions that they perform, but in my play through I noticed that Donald (my mage) would either recklessly use potions or rarely use his healing magic and Goofy would run head first into battle and get himself “knocked out” far too often. I felt I was carrying much of the battle myself most of the time and this was something I remembered from the original game. I was hoping with stronger processing power, the AI companions would perform better. Depending on the world, you can be accompanied by an AI companion from that world (like Aladdin, Ariel, or Tarzan) and they did generally perform better than my core party of Donald and Goofy, so I found myself substituting out one of them for the hero of that world more often than not. Battles can be pretty challenging, whether you are facing down hoards of Heartless or one of the levels boss characters, the fear of getting “knocked out” follow you. It is refreshing though, especially with how easy and accessible games have become these days to play a game that can still challenge me with their foot soldier grunts as much as their generals. One element of the gameplay I disliked as much as the platforming was the Gummi Ship battles. These are on rails shoot em ups where you fly your Gummi Ship between worlds while shooting down Heartless ships. Such a stark contrast from the polish of the gameplay, this felt like such a filler element of the game. I hate having to keep talking about Kingdom Hearts 2 (please I hope a 2.5HD is in the works) but this element of the game was also improved in the sequel and playing the predecessor continues to remind me how much I disliked that part of the game. Controlling the Gummi Ship is wonky and felt like such a cumbersome activity, eventually Cid (Final Fantasy VII’s Cid) installs a navigation Gummi that allows me to warp to previously visited worlds, but that doesn’t come until well over 8 hours into the game. While this review isn’t indicative of the entire package, playing Kingdom Hearts again was a great walk down memory lane. I remembered all the fun times I had discovering each world, and while I have played the PS2 versions a few times since 2002, this chance to FINALLY play Final Mix and in a way rediscover this whole experience was an absolute treat. It may not be the best game for gamers who never played the original, the wonky cameras and frustrating platforming may turn of many of today’s gamers, but for the folks who have played and enjoyed this game on the PS2, this is definitely one that you don’t want to miss. 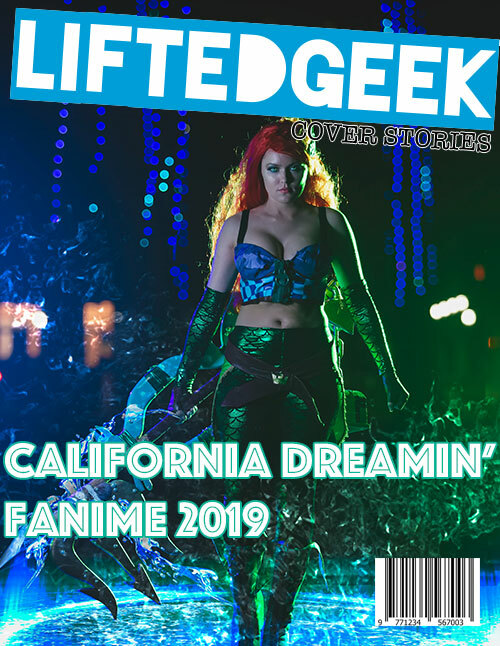 One half of Lifted Geek's co-founding editors. Justin Prince is a gamer, cosplayer, film buff, comic book nerd, fashion whore, graphic designer, and makes one hell of a karaoke partner.